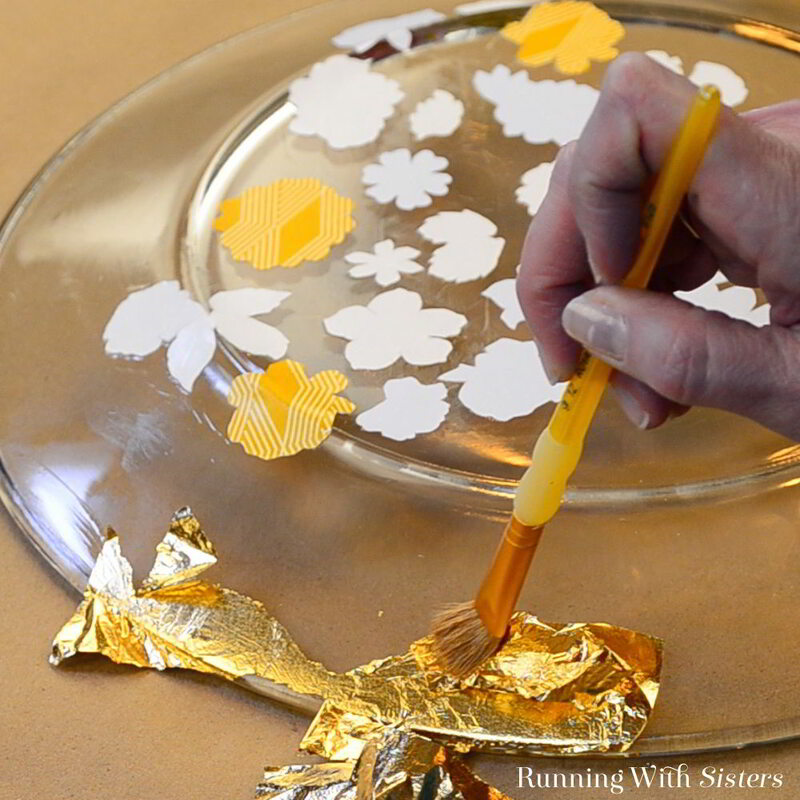 Learn how to turn a glass plate into a pretty floral plate using flowers cut from scrapbook paper. 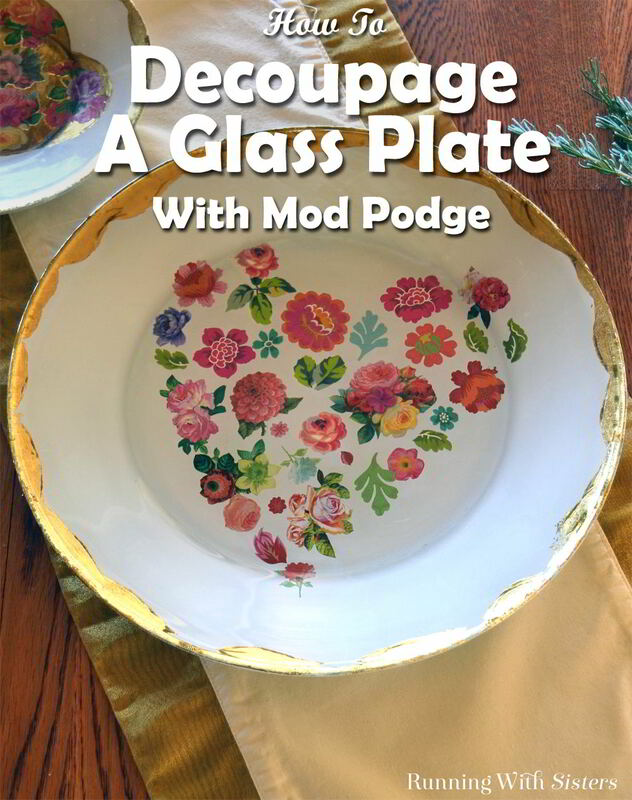 We’ll show you how to decoupage using Mod Podge. It’s easy! Plus we’ll show you how to finish the edges with real gold leaf. 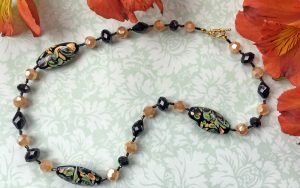 This gorgeous plate would make a wonderful handmade gift for Mother’s Day or Valentine’s Day. Where did we get the idea? 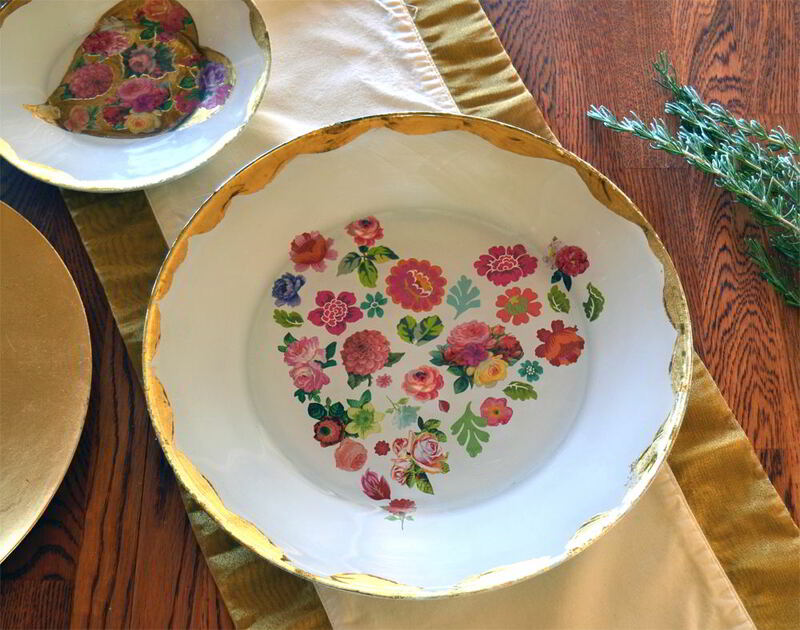 We found a gorgeous plate on Pinterest that came from Anthropologie. (Click here to see it.) It had a beautiful heart painted on it made up of little flowers. But when we went to buy it, it was completely sold out!! What could we do but make our own? 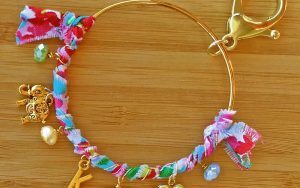 (We love a good Anthropologie hack!) It turned out gorgeous and it was so easy. Here’s a video tutorial we made showing how we decoupaged the glass plate using Mod Podge and how we gold leafed the edge. You can watch along with us while we make the plate, then you can use the step by step instructions below to make your own. 1. Start by picking out some beautiful scrapbook papers that feature small flowers. Cut out a selection of flowers, about 25, plus cut out a few leaves and tiny flowers to fill in spaces. 2. 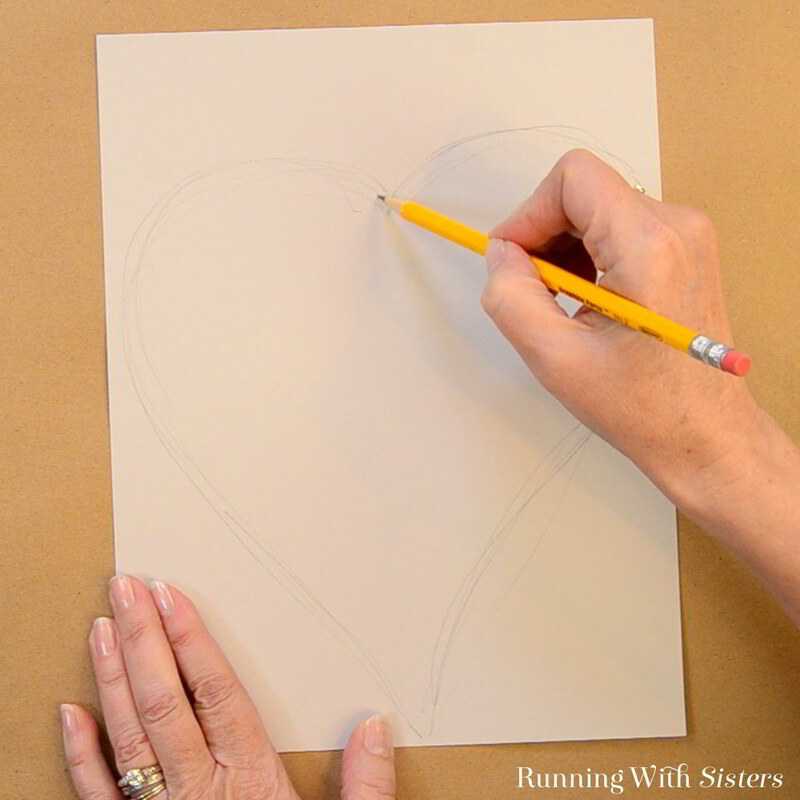 Trace your glass plate on a piece of paper, then draw a heart shape in the center. Cut out the heart and tape it to the front of the glass plate. 3. Turn the glass plate face down. 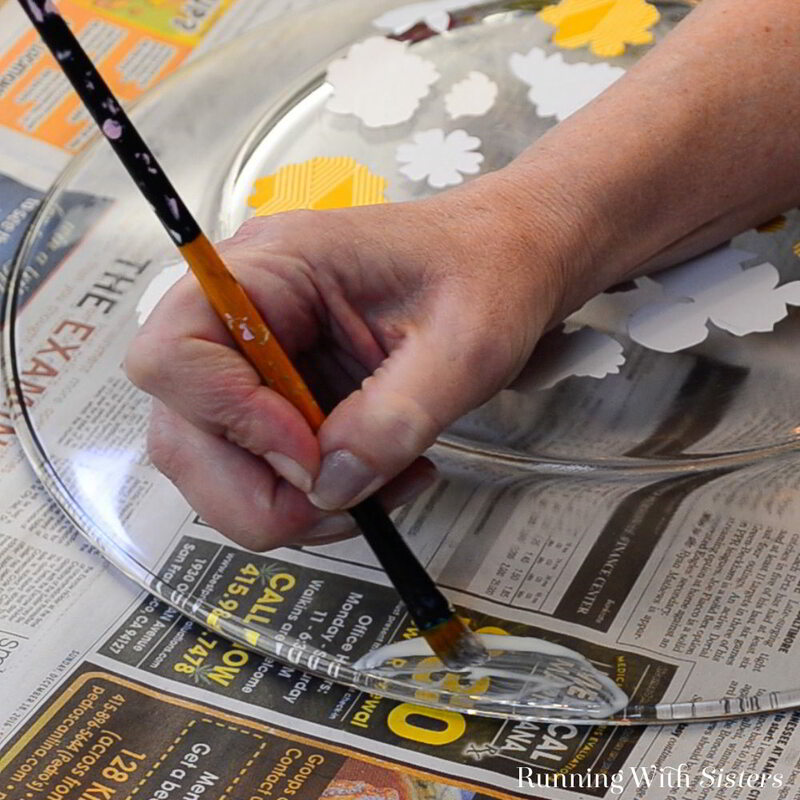 We will decoupage the flowers onto the back of the plate. 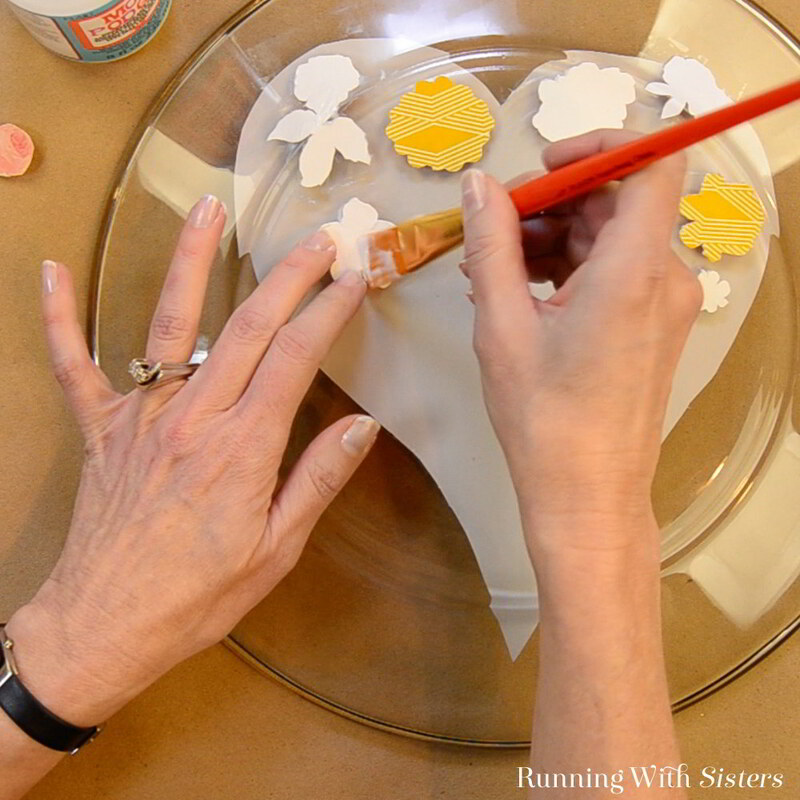 Paint a coat of Mod Podge on the front side of one of the flowers. Press the flower face down onto the plate within the heart shape. Then paint a coat of Mod Podge over the back of the flower and around the edges of the flower. 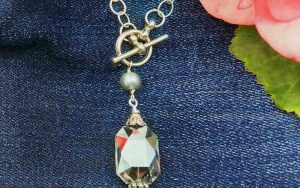 Keep on decoupaging little flowers into the heart shape until you have a complete heart made of flowers. Let the Mod Podge dry. 4. 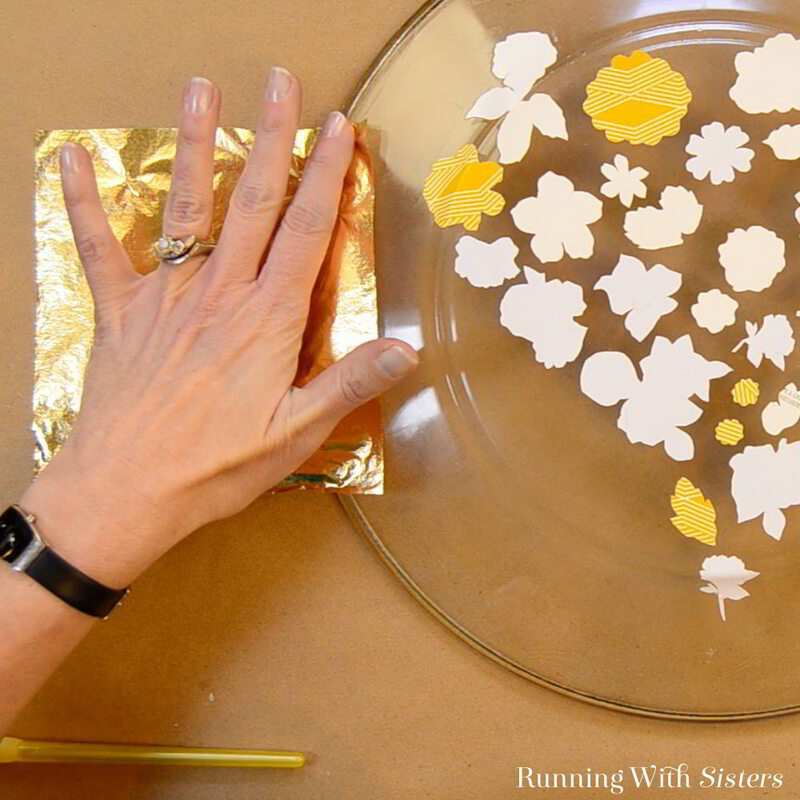 To gold leaf the edge of the plate, paint a scalloped border using the gold leaf adhesive. (Still working on the back of the plate!) Let the gold leaf adhesive dry until it is clear. This takes about 15 minutes. The adhesive will still be very, very sticky. Lay a sheet of gold leaf on the adhesive. Then use a dry brush to brush away the gold leaf. It will stick where the adhesive is. Repeat, adding more sheets and brushing away the excess. 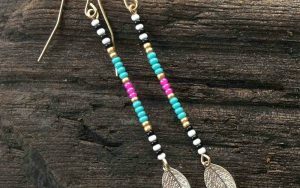 You can pick up and reuse the brushed away gold leaf bits. Keep adding sheets of gold leaf until all of the scalloped edge is gold. 5. 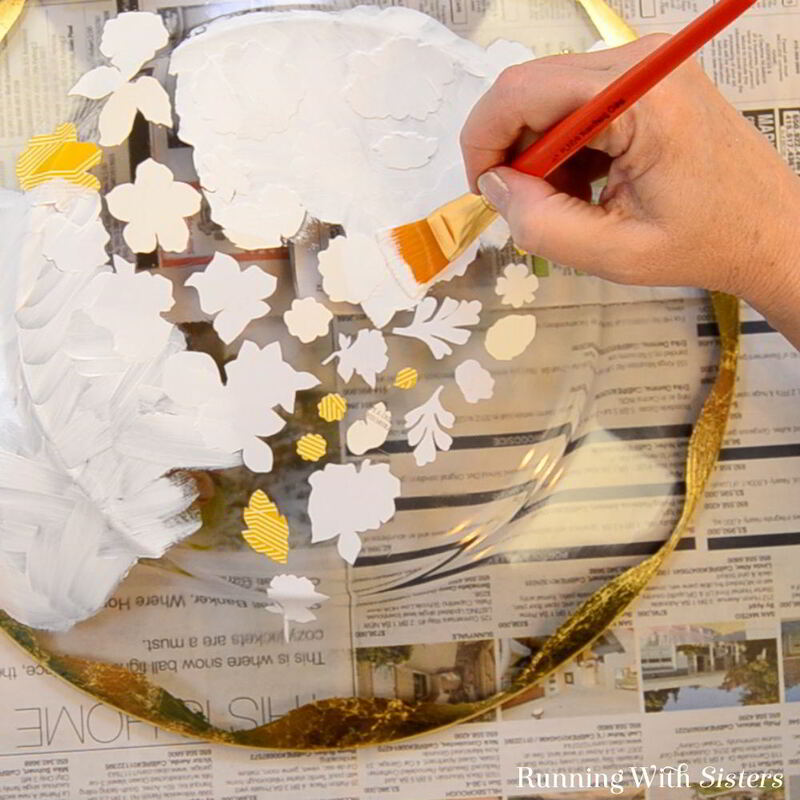 Finish the plate by painting a coat of white acrylic paint all over the back of the plate. You may need to do two coats. Then coat that with Dishwasher Safe Mod Podge. Let dry. Even though we used Dishwasher Safe Mod Podge, we haven’t put the plate in the dishwasher. 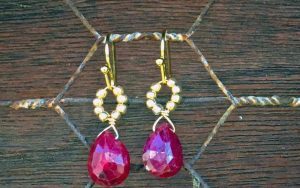 We think it’s too pretty, so we just hand wash it! Remember if you have any questions about this project, leave us a comment and we’ll reply. We are here to help! Great tutorial! Thanks for sharing. Easy ..pretty afternoon project! I have really enjoyed seeing the projects you have published.Thank you very much.